Sister catamarans run by the two brother's Peter and Graham Allen, who have sailed, chartered and raced these waters all their lives. These good-humoured characters know how to make this the best day of your holiday! If you are a first time snorkeller they can teach you how to snorkel as they join you in the water adventure of a life-time. They have over 30 years sailing experience and as they are local they can give you that truly bajan feeling. The personalized service you get from this small family company is exceptional. Whether it is sailing, swimming with turtles, feeding tropical fish or having that lovely "rumpunch" while seeing the flying fish skim the surface of the tropical water, this is definitely the most memorable experience you'll get here in the Caribbean. These impeccably maintained catamarans are real sailing machines. Formerly the personal boats of the Caribbean's number one builder/designer,both enjoyed rich racing careers. These fully equipped 50 and 45 foot luxury cats have spacious decks with close-mesh trampolines for lounging and soaking up the sun, and shaded areas to ensure maximum enjoyment and absolute comfort for everyone. Stiletto carries a maximum of 26 people and Supercats 12. The boats have bathroom facilities and there are ladders to get in and out of the water. We carry snorkelling gear and fins and swim vests to suit. 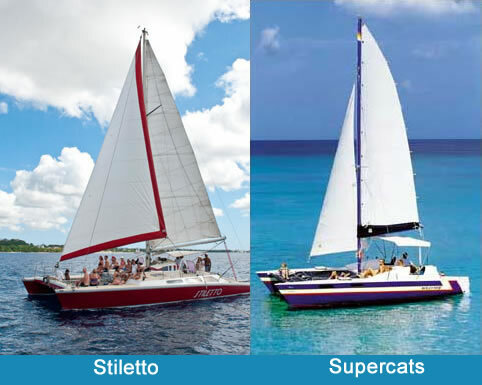 These catamarans can sail right in to the beaches of your choice. This is the best and most reasonably priced private cruise on offer in Barbados. 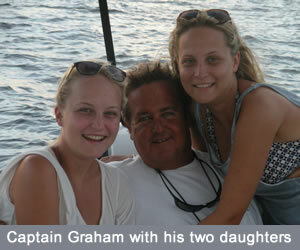 It is your chance to have the boat to yourself with a captain to give you that personalized service all day long. Plan your tailor made adventure with us now. Whichever cruise you choose, you wont be disappointed, and like so many others, you too will probably be back for more! We enjoy creating the tailor-made cruise and tropical adventure that is perfect for you. Book Now to be part of the crew.